This particular post is all about animals. From my trip to Hagenbecks Tierpark here in Hamburg, to the strange animal behaviour of a certain class of no less than 30 17-20 year-old boys who I had to take (all on my own) this week. In line with bizarre things I shall also be telling you the somewhat harrowing story of The Mouse and the Mint. I hope you will be less perplexed and scarred by the experience than I was. You may think that there’d be nothing better to do on a beautiful, sunny day than have a wander around a zoo and feed the animals. You’d be entirely correct in this thought, so you may, dear Reader, be somewhat surprised to hear that three of us decided a dreary, rainy day would be prime opportunity to traipse round a huge open space with little shelter from the rain. Common sense= 0, desire to do tourist things= 1 (Ellie’s obsession with seeing penguins= about 100). Despite the fact that I finished the day resembling a drowned rat with an afro (I have very naturally curly hair which can only be tamed with an incredible amount of heat, time and fierce determination), we actually had a brilliant day at Hagenbecks Tierpark! A highlight was definitely the elephants, who you can feed there, too. 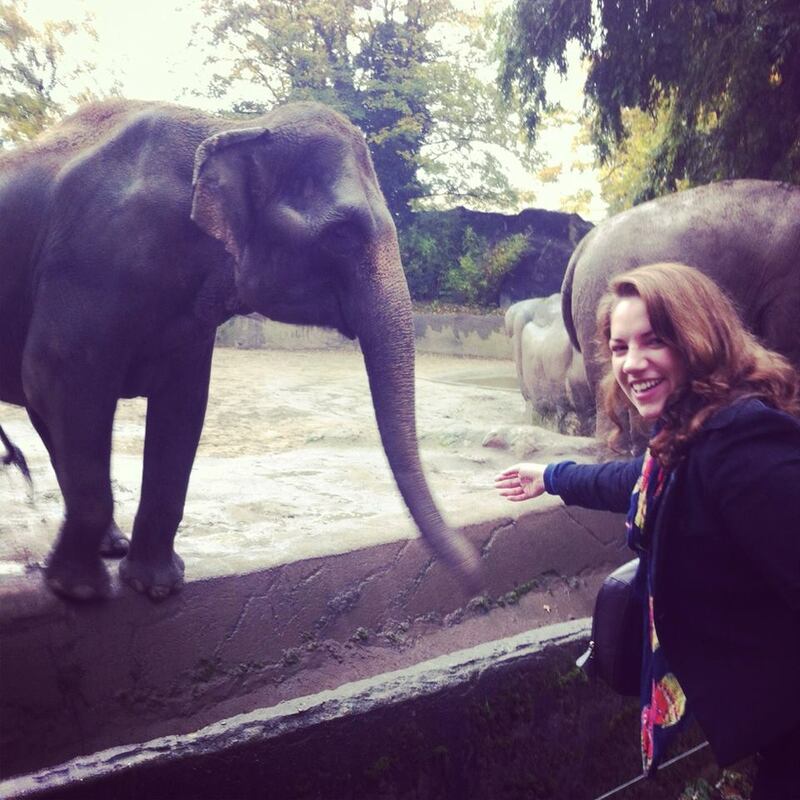 This photo looks a bit like the elephant was trying to get away from me, but I can assure you that the big smile and general happiness were mutual! Tenuously as usual, I’d like to take you from being really excited to see animals, to absolutely dying to run away from them as quickly as possible. In this case when I say animals, I actually mean teenage boys. This week has been project week at my college, so there have been cover lessons all over the place with other teachers being busy helping with practical exercises. I’d like to point out at this point that, contractually, I am not supposed to take any lessons on my own, yet circumstances called for it this week. Thankfully I am now at the stage where reflection upon the ordeals of Wednesday and Thursday afternoons with one particular English class of male teenage painters does not reduce me to tears or blind rage. I can more or less laugh at the ridiculousness of it all now. More or less. Now, it’s nice to receive a bit of attention every now and then, don’t get me wrong. What I had not, however, anticipated in a lesson were wolf-whistles for 45 minutes, or a round of applause and cheers when I took off my coat. I mean, come on now. Initially, the teacher who was supposed to take the lesson came in to introduce me to this brand new class, and to say that they could hand-in their work to me or another teacher at the end. This was then met by a lone cry of something along the lines of, ‘Well I’d definitely give it to Charlotte!’ This same charming young man also asked later if he could have extra English tuition with me alone outside of class, and how exactly he could contact me during the night. I’m slowly but surely developing my brush-off skills in German. If anything, being in that class for over two hours over two days has aged me more than I would normally age in a year. Not ideal. After more obscenities were called at me I left, with a stack of marking in hand, and sat on the train, completely exhausted. 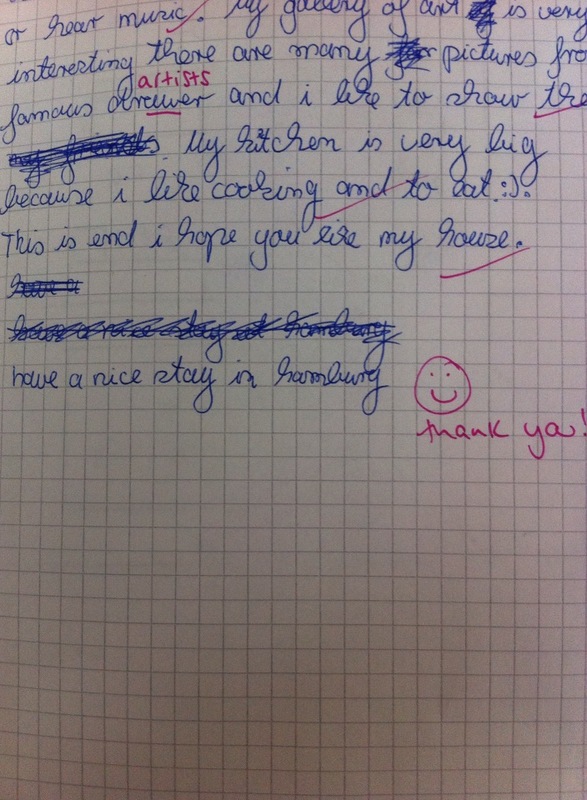 ‘Have a nice stay in Hamburg’! It was so lovely to find that after such a tiring experience with that class; this particular student was quiet for most of the lesson and working away on his task. Every cloud, and all that. Speaking of being tired, this leads me on to my final tale, (or tail, if you will- you’re about to find out why). I was exhausted, having had a lesson at 8am before having to commute half-way across Hamburg for my second lesson of the day at the school’s other campus. I finished work at 11.15am and walked in zombie-like fashion to the train station. As if I weren’t already incredibly delirious, something then happened to add to my confusion. One stop into my journey, a couple got on the train and sat next to me, opposite each other. The man had a little purple cage and there was a tiny animal crawling around in it. I gathered from the way they were fawning over this little being that they’d just bought it. I did not, however, anticipate what happened next. The woman opened the cage and got out what turned out to be a white mouse with red eyes. 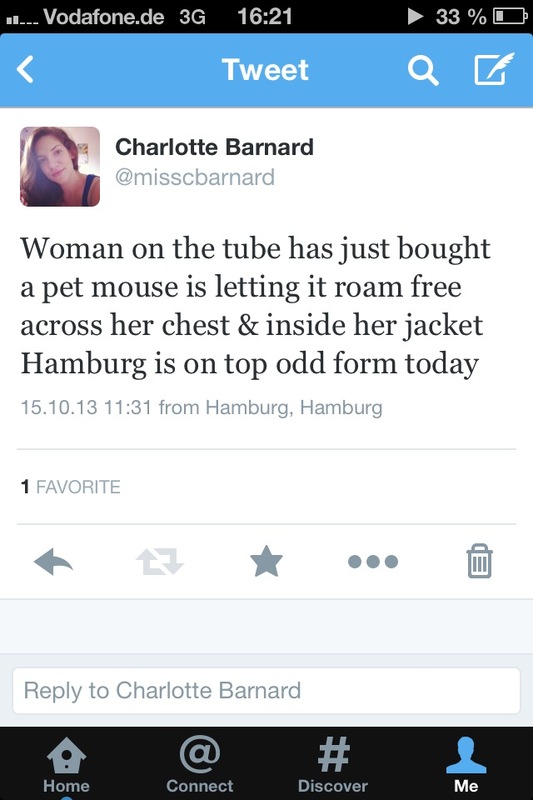 Then, she put the mouse on her rather large chest and let it roam around. I should add that she was rather gifted in this department, so there was a lot of space for the mouse to explore. It then managed to burrow inside the fleece she was wearing, until just its tail was hanging out, and it scrambled about in there for a while. When it disappeared into her clothes, the woman did up the zip of her fleece, and this little mouse was just stuck inside this woman’s fleece for a while. It poked up its head occasionally and seemed to be nipping at her cheek, before hastily rejecting the outside world and returning to the apparent comfort of the fleece. I was trying so hard not to stare, but ultimately failed. I thought the poor mouse’s ordeal was over, until the woman got a bag of mints out of her bag and put one in her mouth. Perfectly normal, I thought. Nothing wrong with that, I thought. 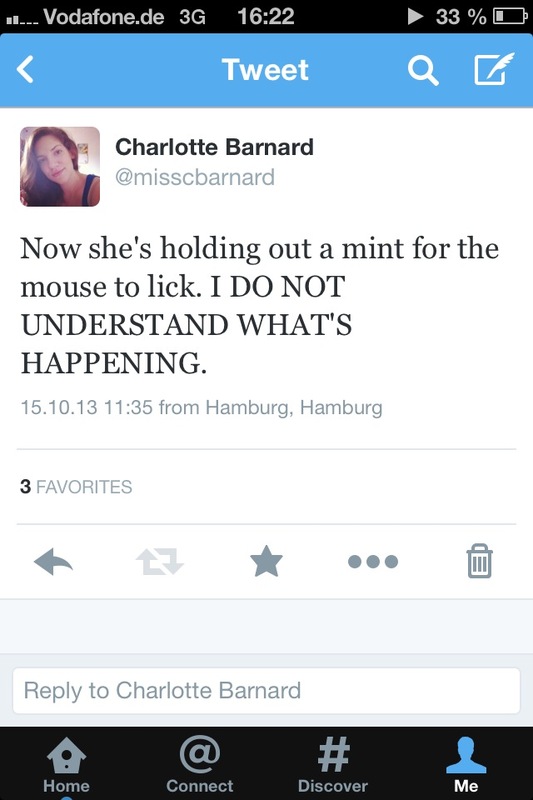 That is, until she took the mint out of her mouth and offered it for the mouse to lick. Possibly out of curiosity, possibly out of stupidity, the mouse did indeed come out of its hiding place inside the fleece and lick the mint, before hiding again. 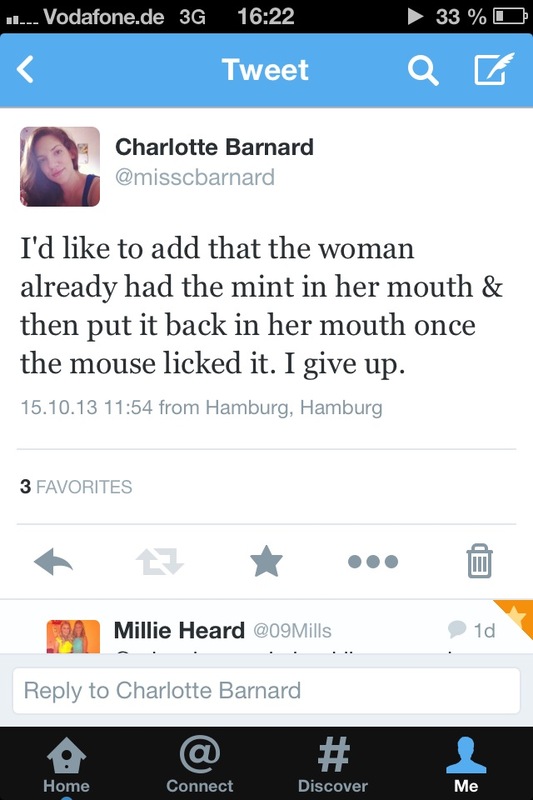 You might be able to guess, despite all your horror, that the woman did actually put the mint back in her mouth. I apologise for certain spelling mistakes. As you can tell, I was somewhat flustered. 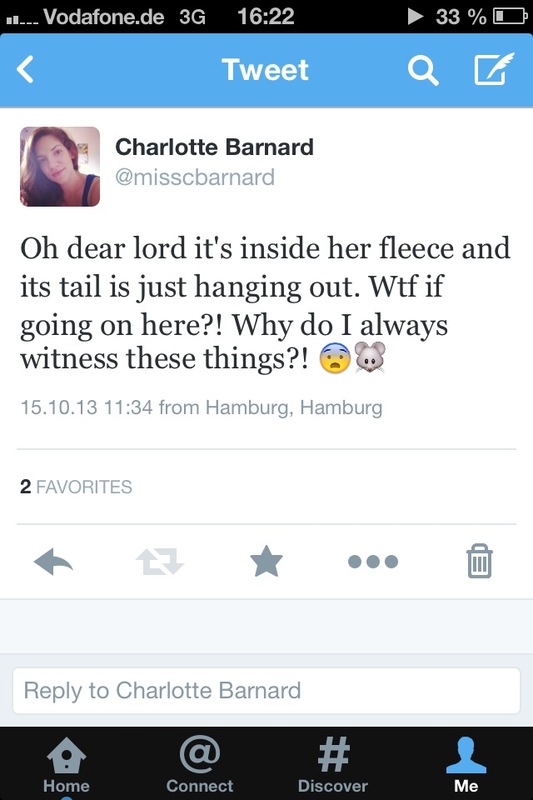 The moral of the story is, kids, if you want a mouse to roam about your person, then please, PLEASE, do it in private. I am not here to judge, but I’m afraid I can’t hold back on staring. ← If only going back to work had been today’s biggest issue. Creepy Neighbour took care of that.